This saga began in November 2001 when 2 hooded seal pups (species name: Cystophora cristata) were discovered stranded on adjacent islands in the Canaries, more than 4000 miles from their Arctic home. The 10 month old pups - Guanche and Majo - weighed little more than 25 kgs (just 1 kg more than their birth weight) when admitted to the Fundacion Canaria Loro Parque suffering from extreme heat exhaustion and dehydration. One of the animals had also been injured by a shark. The pair were given immediate treatment by veterinarians at the facility and placed into a special, temperature-controlled penguinarium home where they were nursed back to full health over the following months. Three months later, and almost 100 kgs heavier -- and gaining a further 1 kg each day -- the seals were ready to undertake a very different return journey to their Norwegian Arctic colony. 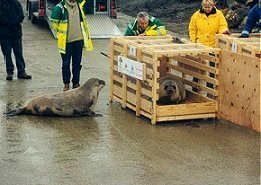 Specially designed containers were constructed to transport the fully recuperated seals on a 4 1/2 hour flight from Tenerife to Glasgow. Accompanied by Loro Parque's senior veterinarian, Lorenzo Crosta, the seals then had to endure a further 30 minute flight from Glasgow to Wick, where BDMLR National Scottish Co-ordinator and director of the CRRU Dr Kevin Robinson and team were awaiting their arrival. The final stage of the seals journey was a short trip by road in the British Divers Highlands Region trailer to Skarfskerry, where a temporary holding area had been prepared by Alistair Jack Sr and his team for the animals to rest overnight. The following morning the pups were fed and tagged by CRRU veterinarian Vicky Balbontin and Sr. Crosta before returning them to their containers for the short trip to Dunnet Bay, just 10 minutes away. On arrival, the containers were moved onto the slipway west of Dunnet Head where the sea conditions would be calmer for the animals release into Dunnet Bay. "As the doors of the containers were opened, the seals seemed a little daunted by the task which lay ahead of them", said Dr Robinson. "Whilst the sea ahead certainly looked appealing, both animals felt it might be safer to stay put afterall!" "Guanche was first to be encouraged out of his container, but he wasn't going anywhere until he was ready. Majo was further behind Guanche, but once he poked his head out into the open, freedom must have seemed far more appealing as he lowered his neck and made a mad dash down the slipway and into the waves". Twenty minutes later, and with a little encouragement, Guanche was also on his way to join Majo accompanied by the cheers of those who had worked so hard throughout the weekend and the spectators who had gathered to witness the magical moment! Hazel Deans from the Caithness BDMLR team commented how wonderful it was to be involved in the actual release of the animals. After picking seals up, they are generally transferred to one of the UK seal sanctuaries and that is usually the last we ever get to hear of them. So to be on the releasing end of a project was certainly pretty unique, and undoubtedly an experience that none of us will ever forget! Immeasurable thanks to everybody who helped throughout this superbly executed operation: CRRU/BDMLR medics from Caithness and Aberdeen, the SSPCA, Lorenzo and his staff from Loro Parque, Britannia Airways and Thomson, Highland Airways, and BDMLR vet James Barnett and Vicky Balbontin. To read more about hooded seals, visit: www.pinnipeds.fsnet.co.uk/species/hooded.htm.